There was smoke, but not much if any fire, on North Spring Street just before lunchtime on Thursday. Firefighters leave the home in the 200 block of North Spring Street where smoke was reported Nov. 8. 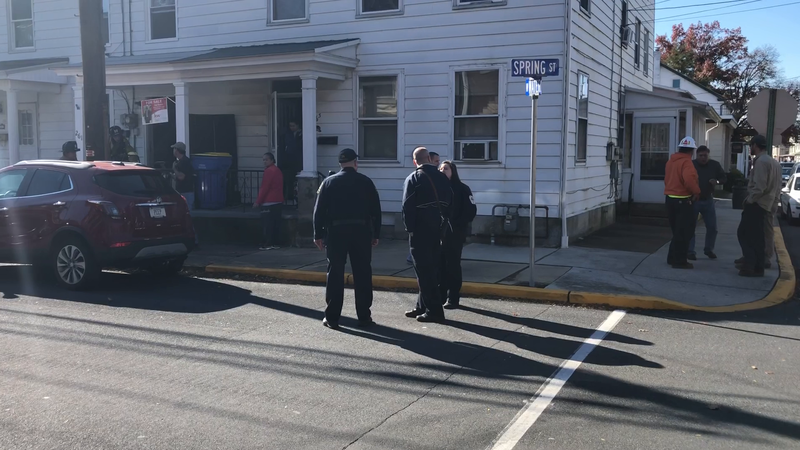 Firefighters, residents and onlookers gather at the intersection of North Spring Street and West Water Street after smoke was reported coming from a home Nov. 8. Smoke was reported coming from a home in the 200 block of North Spring Street on Nov. 8. A firefighter walks through the intersection of North Spring and West Water streets Nov. 8 after a fire was reported in a rowhouse. Multiple fire departments responded and several tower trucks were on the scene in the 200 block after a neighbor reported smoke coming from one of the rowhouses near the corner of West Water Street. Fortunately, the damage was very minimal. The homeowner, who was at work at the time of the fire but arrived as firefighters were wrapping up, said the cause appeared to be a malfunction with the gas stove. No one was cooking at the time, but a piece of metal from the facing of the stove might have come loose and potentially caused the smoke. There were no injuries, and the only significant damage was to the front door, which firefighters broke to gain access.